Hawick Royal Albert have appointed Kevin Milne and Grant Scott as their new management team. After Dean Shanks and Dean Robertson, plus coaches Scott McKenzie and Alisdair McVeigh sensationally quit the club last week, the Royalists have moved quickly to bring in the duo ahead of tonight’s (Wednesday) East of Scotland Qualifying Cup semi-final against Lothian Thistle Hutchison Vale at Albert Park. Former Aberdeen, Stirling Albion and Forfar Athletic signing Milne has been appointed manager and ex-junior footballer Scott his assistant. 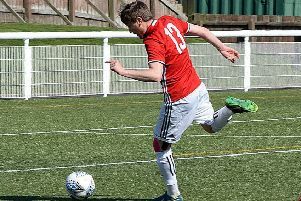 Thirty-five-year-old Milne, who has played under the wing of many managers in his footballing playing days, including Roy Aitken, Alex Miller, Neal Cooper and Ray Stewart has been involved in ladies football since hanging up his playing boots. Milne started off coaching Hearts Ladies and of late has been leading coach with Hibs ladies. Scott has also been involved in the ladies scene as a coach with Hearts ladies.